University President Rev. 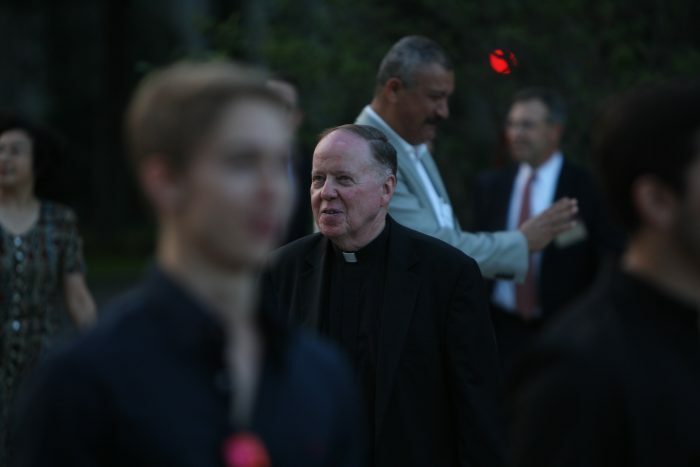 William P. Leahy, S.J., signed a statement Tuesday that affirms Boston College’s commitment to upholding Deferred Action for Childhood Arrivals (DACA), an executive action signed by President Barack Obama in 2012 that gives protected status to undocumented students. DACA is threatened in the wake of the election of Donald Trump, who said he plans to repeal several of Obama’s executive orders, which could include DACA, in his first 100 days in office. Leahy signed two statements specifically, the first from Pomona College and the second from the Association of Catholic Colleges and Universities. Leahy’s action follows the release of a petition yesterday that called on the University to declare BC a sanctuary campus for undocumented immigrants and other groups, such as Muslims, who Trump has targeted. Members of Eradicate Boston College Racism launched the petition, which says there is fear among some students that they could be directly affected by Trump’s actions. “In light of very real and immediate threats faced by members of our community, we ask the university to commit to defending diversity and inclusivity and to upholding Boston College’s Jesuit values by declaring Boston College a sanctuary campus,” reads the petition, which was written by several students who incorporated language used in similar petitions at other schools. As of 5 p.m. Tuesday, the Pomona statement had been signed by 380 presidents of U.S. colleges and universities. Since the election, several mayors have declared their cities “sanctuary cities,” signaling their intention to resist any attempts by the Trump administration at mass deportation of undocumented immigrants. Somerville, Mass. is an official sanctuary city. Boston Mayor Martin Walsh, WCAS ’09, said after the election that Boston already has significant sanctuary policies in place—Boston police do not participate in deportation efforts—and does not currently plan to alter them. Correction: The article originally stated that Natali Soto, BC Law ’17, wrote the petition. The petition was written by multiple students. One more reason to can Leahy. He is an incompetent who has destroyed University athletics and now wants to snub American laws. ILLEGALS, go ahead and say it, it’s really easy to tell the truth father, either that or leave the church if you’re going to lie.